Individuals and teams battled it out on the cross country course this weekend all over the state. We recapped all 16 regions so you can stay in the know on the top storylines from this past week. Here are the recaps and takeaways from all the FHSAA 4A regional meets. A storm was brewing in Gainesville during the 4A Region 1 meet. With temperatures in the mid 70s and high humidity it was a typical, Florida day you could say. In the girls race, there was a large pack that took it out fast from the start. Ashley Klingenberg, Cadi Rowe, and Mackenzie Czurak, and Mya Bodrato were pushing the pace. Amber Schulz followed the pack closely and waited till after the two mile to make her move toward the front of the pack. Her strategy paid off and Schulz took home the individual title for Timber Creek in a time of 18:20. Klingenberg battled an injury the past few weeks and was bound to pool workouts. She came out and showed the pool had paid off with her second place, 18:32 performance. Klingenberg along with teammate, Chloe Hyde, led the Lake Brantley girls to the team victory in 101 points. Mei Chiang, a Fleming Island freshman, finished eighth in a time of 19:04 to lead the Fleming Island girls to a runner-up team finish. It isn't called the region of death for nothing. It took a team average of 20:41 to qualify as a team out of the region. It was the Oviedo show in the boys race. Kayamo Galloway, Angel Vicioso, and Mamush Galloway took it out hard from the gun. Kayamo Galloway took the individual title in a time of 15:55 with Vicioso taking second in 16:08. Jake Lockhart had a strong third place finish, running a time of 16:13 to lead the Lake Mary boys to a fourth place finish. Oviedo boys took the team title with 75 points, West Orange followed with 82 and Windermere with 99. It will be an exciting state meet when these teams get to compete against the Sarasota, Steinbrenner , and Newsome squads. 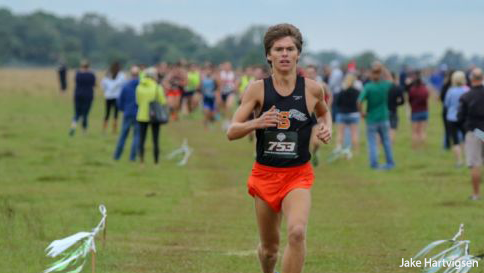 Sarasota senior, Ben Hartvigsen, took home another regional title in a time of 15:37 to lead the Sarasota boys team to the team victory as well. Nehemiah Rivers, a senior out of Wharton, ran a massive PR of 15:45 to place second and Jonathan Reid out of Lakewood Ranch finished third in 15:57. Sarasota, led by Hartvigsen, Alan Galicia Romero, Anthony Bilotta, Ryan Guendjoian, and Orlando Cicilioni all packed up to capture a 55 point team win. Dominic Acosta finished sixth in a time of 16:12 to lead the Newsome boys to a team runner-up finish with 87 points. Alyssa Hendrix does it again with a sub 18 performance, running 17:36 at the Farm! A very strong showing by the junior and the 4A leader. Mary Ellen Eudaly, a freshman out of Plant, ran a fantastic PR of 18:14 to place second in her first regional race. After coming off a district win, Caroline Lehman, a freshman out of Manatee, finished third in a time of 18:20. Never underestimate the power of HB Plant. Eudaly led the squad to a 68 point win with a 19:30 team average. They are currently the number one ranked team in 4A. Isabelle Jester finished fifth in a time of 18:50 to lead the Sarasota girls to a runner-up team finish with a close 73 points. Rylee Pustilnik took the girls individual title in a stellar run of 18:07 on the South County Regional Park course. Pustilnik has had a consistent progression this season and her performance shows she will be among the top athletes on the line on Saturday. Pia Beaulieu took second place in a time of 18:38 for Boca Raton. Pustilnik along with her teammates: Lila Clarkson and Zoe Pustilnik led the Spanish River sharks to a 57 point team title with a 20:16 team average. Morgan Velazquez finished seventh in a time of 20:12 to lead the Park Vista girls to a runner-up team finish in 66 points. Logan Kraus, a senior for Melbourne HS, won the boys race in a huge PR of 16:08. Kraus added another championship title to his belt after he won the 4A District 9 race in a time of 16:52. Joe Wester finished second in a time of 16:15 and Isaias De La Puente, finished third in a time of 16:20. It was a close race for third with Will Noonan, a senior out of Spanish River, finishing fourth in a time of 16:21. This was an impressive PR for Noonan as he led the Spanish River sharks to an 81 point team win with a 17:04 team average. Mason Colby finished eleventh, running a time of 16:48, to lead the Palm Beach Central boys to the team runner-up regional title with 102 points. Jordan Shapiro, a junior out of Miami Palmetto, won the regional title in a time of 19:20 on the always difficult Larry and Penny Thompson Park course. Rebecca Bergnes, a junior out of G.Holmes Braddock, finished second in a time of 19:41 and with the help of her teammates: Jordan Ford (20:02) and Paola Bencosme (20:21) the Braddock ladies ran home with the regional team title with 33 points. Alana Batista finished seventh in a time of 20:34 and led the Lourdes ladies to a second place team finish with 47 points and a team average of 20:44. Fort Lauderdale sophomore, Michael Fiore, had a strong race, winning the regional title in a time of 16:19. Fiore was 10 seconds off his PR and beat out Aidan Breslin for the win. Breslin has had a breakout junior season and finished second in a time of 16:28. Kevin Kerjean and Alvaro Canarte finished fifth and sixth with times of 16:55.24 and 16:55.64 to lead the Columbus boys to the team title with 48 points, dominating the field. Breslin led the St. Thomas Aquinas boys to a second place finish with a team average of 17:25.